Avast! Free Antivirus won the top rating for malware removal from independent research organization AV-Comparatives last month, and this month is the only antivirus solution that also received the ADVANCED+ award for performance. The latest performance test measured the impact on system resources and speed of 19 antivirus products, and avast! Free Antivirus was the best scoring FREE product again. 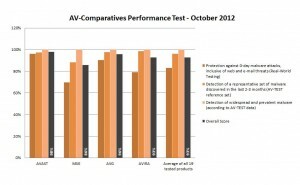 AV-Comparatives performance testing is a series of real-world scenarios that includes downloading, extracting, copying, and encoding files, installing and launching applications, in addition to an automated testing suite. The ranking system is three-levels: "Standard," "Advanced" and "Advanced+" awards. To receive the "Advanced+" award, avast! Free Antivirus was compared to mostly paid-for antivirus suites based on how much impact the product has on system resources, including protection against ‘real-world’ zero-day malware attacks, detection of a representative set of malware discovered in the last 2-3 months, false positive rates, and scanning speed. Avast was the highest scoring free product and out-shined a host of paid-for products and other free products. These results are proof that it is not necessary to pay for excellent quality antivirus protection. Avast! Free Antivirus provides award-winning high protection rates against malware without degrading the system performance or troubling users. Get award-winning antivirus protection on your own PC, download avast! Free Antivirus. We also have award-winning protection for Mac and your Android devices.